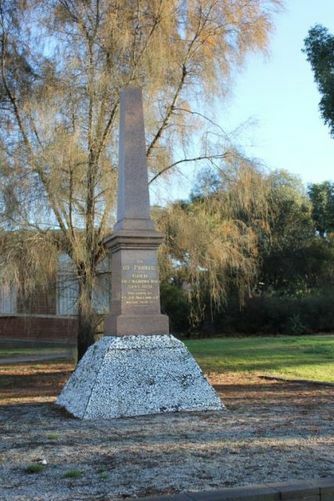 An obelisk by Bendigo Creek marks the site of the first gold discovery in 1851 and is a tribute to the pioneers. In the late spring of 1851 two women from the Ravenswood Run, Margaret Kennedy and Julia Farrell, struck gold in "The Rocks" area of Bendigo Creek, in what is now the suburb of Golden Square. They were seen with gold by a journalist who reported what he saw to Melbourne and the rush to Bendigo began. To commemorate the discovery of the Bendigo gold field, the retiring mayor (Cr. Holland) has presented to the city an imposing obelisk, which has been erected on the spot, at Golden Square where, according to accepted records, the first find was made in September, 1851. The memorial was unveiled by the Prime Minister on Saturday in the presence of a large gathering. In performing the ceremony the Prime Minister said there were three outstandingly important stages in the history of Australia — its discovery by Captain Cook, the discovery of gold, and the great war— which made us a nation. Age (Melbourne), 21 August 1922. Cr. J. E. Holland J. P.